Bluetooth speakers are spilling out of every corner of every manufacturer at the moment and we're seeing swathes of new names surfacing too. Divoom is one of those names that you might not immediately familiar with, and that might put a question mark over whether it's worth spending your cash on its OnBeat 500 portable Bluetooth speaker. Sometimes we can sound like such skeptics, can't we? But caution is a good thing. We love to try new tech out and so we've loved testing out the OnBeat 500 by channeling all kinds of tunes through it over the last week. 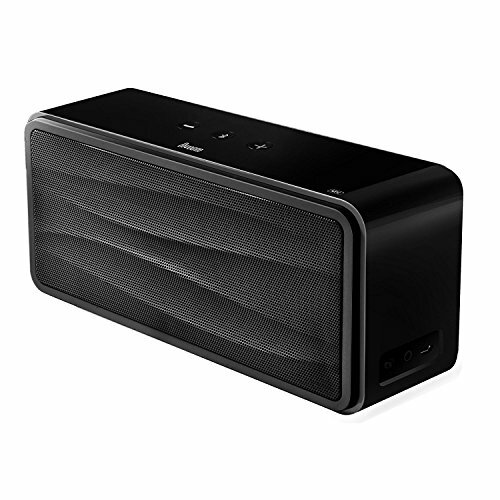 Whether a known name or not, from what we've heard it looks like the Divoom name will make its mark on the mini speaker map as this Bluetooth speaker system delivers plenty of thump where it counts. And at under £100 it's fairly priced too. But can it deliver enough pep to act as a hi-fi replacement? On the front of the OnBeat 500 is a grille with wave-like shapes that covers over the twin 2-inch satellite speakers and a built-in 3-inch mini sub. Whether this wave pattern is purely visual or for sound purposes we don't know, but it adds that extra something when looking at the device we suppose. We'd probably prefer a flat grille, though, like that on the similar-priced Cambridge Audio Minx. But each to their own. Design-wise everything else is fairly simple, again much like the Minx really. On the one hand it's unlikely that the Divoom will win any design awards for its aesthetics, but on the other its straightforward shape, size and choice of black or white finish means that it'll fit in to pretty much any room in the house. It's under 23cms long too, so it's a compact unit that's not too imposing. At under £100 we weren't expecting premium materials to be top of the list, which comes with the territory. The OnBeat 500 is all plastic to the exterior, but as it's glossy it doesn't look too budget. It's the right balance of materials to visual appeal at this price point. However, if you happen to handle it a lot then the finish is a total fingerprint magnet - as you can see from our pictures - and that won't leave the device looking its absolute best. Get the polish out. Key to any speaker is whether it sounds any good or not, otherwise what's the point in buying? At this price point we had a bar of expectation in our minds and weren't sure whether it would be met. But after switching the OnBeat 500 on for the first time we were genuinely blown away by what it can deliver - it's raised our bar of expectation that's for sure. Now we might not be talking about a full-on hi-fi system with separate subwoofer here but, you know what, the Divoom has all the basics in it that you'll need for whatever you like to listen to. The amount of bass kicked out from this small package and its 3-inch internal sub is very, very impressive all things considered. We've had it sat on the side of the sofa where it made everything rumble while listening to some of Teebee's bass-heavy tracks from the Sine Waves compilation on Subtitles Music. It misses out the ultra-low frequencies, but digs down to 60Hz which is plenty good enough for handling all genres, certainly from a bass guitar. With Foals' latest album Holy Fire fired up, and the Bluetooth pinged over from our laptop to the OnBeat 500, we were impressed with the fullness of the tracks. Vocals sat cleanly out in the mix and, like detailed above, bass was delivered with plenty of thump. If we're critical then the mid-range can sound a little flat; there's less sparkle on, say, snare hits than you might want and when pushed up loud - and the OnBeat 500 goes real loud - some more heavily compressed tracks push the mid-level to the limits. But that was a rare occurence. Although the OnBeat 500's RRP is £130, we've spotted it online for less than £100 delivered to your door. That sub-£100 price point is as much a thing of initial concern as it is a thing of enticement. It almost unwittingly gives the impression that it's cheap and, therefore, not going to sound any good. But that's so far from the truth: few people would be disappointed with the Divoom's sound quality. And when there are portable products like the Ultimate Ears UE Boom - a portable cylindrical speaker that we loved - for considerably more money, the value prospect of the OnBeat 500 hits home even more. It's a total bargain. When it comes to connecting a Bluetooth device - or there's a 3.5mm jack on the rear for wired connections - it's super easy to find a device and pair or use NFC for one-touch connectivity. The trio of buttons on top of the device - volume up, volume down, and Bluetooth pair - are as complex as things otherwise get. The classic Bluetooth symbol of the centre button of the model we have has been replaced with a telephone symbol in the final boxed versions of the product and we're not at all taken by this design change as it just seems a bit odd. But it's a small point, so we can't moan too much about it. If you're after a full-on hi-fi with on-screen controls, the ability to plug in files via USB, and so forth, then the Divoom won't be for you. But this is 2013 and that's not what a Bluetooth speaker is all about. Other than that it's hard to align many complaints at the OnBeat 500 at all. For the price it truly is on the beat. If you're not familiar with Divoom then don't let that put you off considering buying the OnBeat 500. For its sub-£100 price point it thumps out the audio. It's loud, there's lots of bass considering the small size, and tracks sound full. Indeed we find it hard to complain about pretty much anything bar a few small niggles in design terms, such as how easily the body marks up with fingerprints. Ignore that and, while the OnBeat 500 might not replace a full-on hi-fi system, we've otherwise been rather astounded by the big things this small package can do. Diboom is more like it.